There really are more than enough attractions and beaches to meet the needs of holiday makers on Naxos. However, since Naxos is so close to many other Greek island attractions, more and more tourists are choosing to enjoy day trips and excursions to both Ios and Paros, enjoy a day of island hopping. Further afield are the islands of Mykonos and Santorini, the attractions of which can be reached in around three hours. 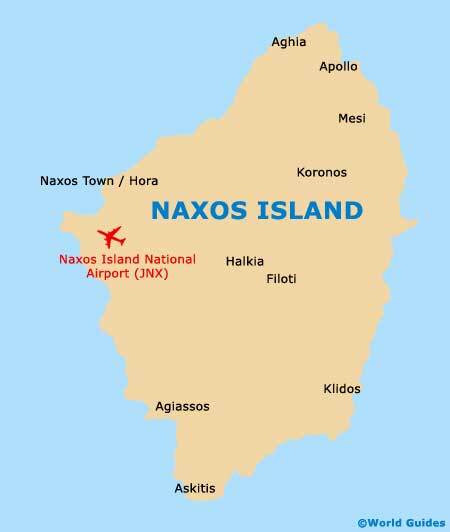 Regular sailings connect Naxos with these neighbouring islands and more. The ferry rides are particularly pleasant, with scenic views along the way. You can choose between sitting on the open deck and enjoying the sunshine, or in the air-conditioned lounge below, where you can relax in comfort enjoy a drink from the bar. Slowly losing its reputation as the number one party island of the Cyclades, Ios is now attracting large numbers of holiday makers, of all ages. Daily ferries connect Naxos and Ios in just over an hour, along with slightly faster hydrofoils, which are known as the 'Flying Dolphins'. 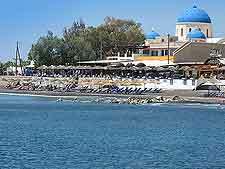 The leading attractions on Ios tend to be based around its three population centres of Hora, Mylopotas and Ormos, which are located close together around the island's western coastline. The journey to Mykonos lasts around three hours and briefly stops off at Paros along the way. Once you arrive in Mykonos, you will be greeted by a choice of attractions, which range from the famous party beaches of Paradise and Super Paradise, to museums, quality Greek restaurants, scuba diving and some historic sights, including the 6th-century marble bell tower, Moni Panagias Tourlianis, which is located within the village of Ano Mera. 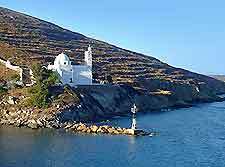 An extremely popular Greek holiday destination and just a short hop from Naxos (around one hour), the island of Paros has gained itself a reputation for being an extremely welcoming an friendly island, and deservedly so. Paros is the second biggest out of all of the Cyclades islands and brimming with quality attractions for everyone. Visitors to Paros will be able to water sports, the Greek tavernas lining the Parikia seafront, and the church of Panagia Ekatantapiliani, which is known to date back as far as 326 AD. There are of course so superb beaches on Paros, such as Agia Irini, Farangas, Kato and Logaras. Piraeus can be reached by ferry is approximately five hours and is actually the ancient port city of Athens. Ferries running between Naxos and Piraeus are extremely frequent during the summer season and the main operator is Blue Star Lines, although there are now also some high-speed catamarans plying the route, which knock the journey time down to just under four hours, although the ticket prices are understandably much more. Some of the main attractions within Piraeus are based around the eastern region and the Zea Marina, along with the Mikrolimano harbour, where endless restaurants line the seafront. And with Athens just so close to Piraeus, you can easily pop to the Acropolis if you leave time. Those holidaying in Naxos and wishing to spend so time island hopping will find the attractions of Santorini hard to better. Santorini can be reached in just over three hours by ferry and has plenty of offer, particularly around the towns of Fira and Oia, which can only be described as stunning. Many public beaches, wineries, recreational activities and scuba diving opportunities also present themselves on Santorini, along with cable car rides, archaeological museums and shops, which tend to target the crowds of arriving cruise ship passengers.